The Moon cycles and their correlations with everyday life are the foundation of the Lunar Astrology. To gauge your emotional climate, look at where the daily Moon is and you will be able to determine what the overall emotional energy of the day will be. Actually, the span is two and a half days, since the Moon travels across one sign of the zodiac approximately every two and a half days in order to journey through all twelve signs during the course of one month. The calendar below shows the phase of the Moon for each day of the selected month. 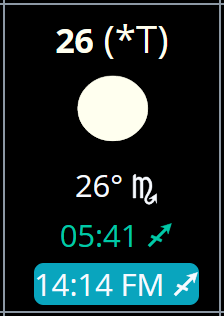 You can click on the sign icons at the calendar and take a look to discover what you can expect when the daily Moon is in each sign. 21 (*T) : At Full Moon, there is a total eclipse of the Moon, on 21th. 22 56' : At the start of day, Moon in 22°56' Gemini. 12:23 : At 12:23, Moon moves to Cancer. Full Moon 10:45 : At 10:45, there is a Full Moon. For Moon phase texts click on the sign icons. : DST begins, : DST ends. Knowing the right time to plant which varieties of vegetables and plants, and which Moon signs are fertile or barren, is just one way knowing what sign the Moon is currently in helps us out. The same rule applies to us in our daily lives, knowing what the energies and overall tempo of the day will be when the Moon is in each of the twelve signs will help us to chart our own course for the day, and give us a good idea of what activities we can best pursue during that particular Moon phase. A Lunar Eclipse occurs at the time of the Full Moon when the Sun and Moon are in opposition to each other. They are at the point of maximum stress and represent the culmination of events, a catalyst, from which only dramatic change can come based on what has already been experienced. • This Universal Moon Calendar service helps anyone who needs to know the Moon's phase and eclipse dates. • New Moon ... Full Moon : Waxing Moon (~14.5 days) Full Moon ... New Moon : Waning Moon (~14.5 days).